As K–12 STEM (science, technology, engineering, mathematics) education tries to move full steam ahead in schools nationwide, thousands of teachers, principals, policymakers and others are saying some major challenges still persist. To help conceptualize and dismantle these issues, a national nonprofit organization Thursday released a map of more than 100 problems currently facing STEM education. In addition, it revealed a $28.175 million investment from Google, AT&T, Chevron and other organizations to address these challenges. The resulting “Grand Challenges” interactive map is a two-year project from 100Kin10, a nonprofit with the ambitious goal of training 100,000 teachers in 10 years (by 2021). To identify and map the 100-plus challenges, 100Kin10 conducted extensive background research leveraging the support of its network — including surveys with thousands of teachers, principals, nonprofit leaders, researchers, policymakers, union representatives and other education stakeholders. In addition, complexity and mapping scientists as well as strategists across the business and tech sectors contributed to the analysis, according to a prepared statement from 100Kin10. Among the challenges are various job performance, culture, policy and financial drivers that “affect many other causes but are affected by relatively few,” the statement said. 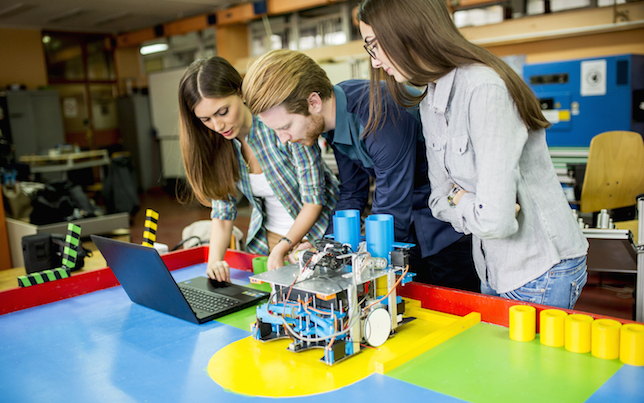 While 100-plus obstacles might seem like a lot for STEM stakeholders to chew on, 100Kin10 has traced these down to six root causes. Scholarships or loan forgiveness for STEM college majors entering pre-K–12 STEM teaching jobs. “This roadmap will allow us to mobilize 100Kin10 partners to address the root causes of the STEM teacher shortage head-on, and in doing so, help ensure America remains a beacon of innovation and competitiveness for generations to come,” said Talia Milgrom-Elcott, executive director and co-founder of 100Kin10, in a prepared statement. One 100Kin10 partner for example, the University System of Maryland (USM), has used Grand Challenges to focus its work with Baltimore City Public Schools (BCPS) on a particularly pressing challenge: implementing Next Generation Science Standards for all its students without enough physics teachers. The Grand Challenges interactive map is now live.